Petroleum exploration of frontier areas, such as the Madre de Dios basin, requires an innovative model based approach in order to lower the exploration risks. For this purpose, the DionisosFlowTM software has been used to explore the Silurian and Devonian stratigraphic sequence at regional scale and to determine if reservoirs observed at the wells location were likely to extend to the South where no well has been drilled. The simulation of stratigraphic and sedimentary processes allowed to create a 3D geogrid predicting the internal stratigraphic architecture of the Silurian and Devonian series, consistent with well data, seismic and regional geological information. The geogrid includes reservoir distribution, sealing capacity and deposit environments. 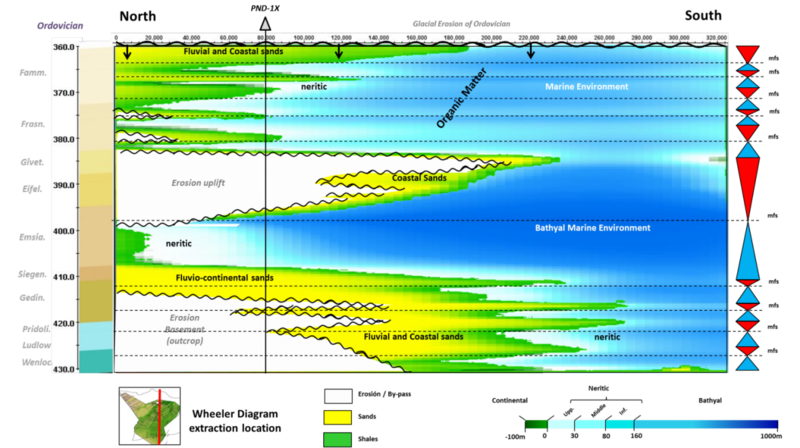 Particularly, the resulting model has highlighted the presence of a large clinoform sequence during the middle Devonian period revealing a reservoir unit made of coastal to deltaic front sands extending toward the South of the basin. Such prograding sequence results from an uplift of about 200m where erosion and remobilization of sediment provided a large quantity of silico-clastic deposits to the south in deeper bathymetric area. 3D simulations of stratigraphic and sedimentary processes provided maps of net sand thickness and seal distribution all over the basin. A subtle tectonic event was identified defining a new potential play in the Madre de Dios basin originating from a mild regional structuration inducing structural traps. Additionally, the model provided a consistent stratigraphic chart for Silurian and Devonian period.